The homeowner with a small garden and a contemporary house has all opportunities to use many kinds of low-growing trees. The tall, towering elms, horse chestnuts, and sugar maples are out of fashion. Why use them when you can find enterprising nursery’s with an extensive list of trees, under 35 feet in height at maturity. 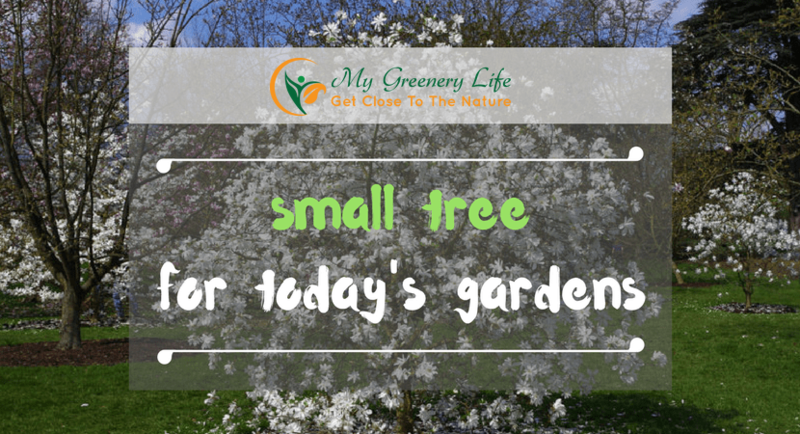 Some kinds of small trees provide shade, while others put on a show of beautiful flowers and fruits during the spring and fall seasons. Others have brilliant autumn color, serving as desirable ornamentals for more than one season. Among the small trees, some are narrow in habit, while others are round and mound-like. At the same time, some do best at the seashore, while others need a protected place in which to thrive. All can be used to advantage to provide interest at advantageous points. Certain kinds, however, are more suitable for special situations. For example, types of yucca trees look best in a desert or southwest style landscape. The trees we have selected to discuss will seldom grow over 30 feet tall. Many “mature” when under 20 feet in height. Obviously, trees of this proportion are useful on the small property because they are more in scale with the house, property, and garden than larger trees. Likewise, they are much easier to spray and prune. Their smaller height does not indicate slower growth, although it is true that not many trees grow as fast as an elm planted in good soil. The size of the tree to purchase generally depends on two factors, namely, cost and rate of growth. Houses in newly developed areas have an unfinished appearance without trees of suitable planted in the ground. In such cases, it is wise to buy the largest size available. If, however, rapid growth is not desirable, a six to eight-foot tree is certainly less expensive. Additional time and money can be put into digging the right kind of hole, with good soil and mulch for the roots. Sometimes, smaller trees, carefully planted at the start, will eventually overtake similar, larger trees that were not carefully moved and cared for at planting time. Where to place the tree in the landscape demands careful consideration. First, knowing the mature size is essential. Also, pay particular attention to the kind of tree. Will it be valued for its flowers, fruits or shade? Also, consider if it is needed to hide an unsightly view or to shade the living room. This same careful thought is also necessary to select the proper kind. 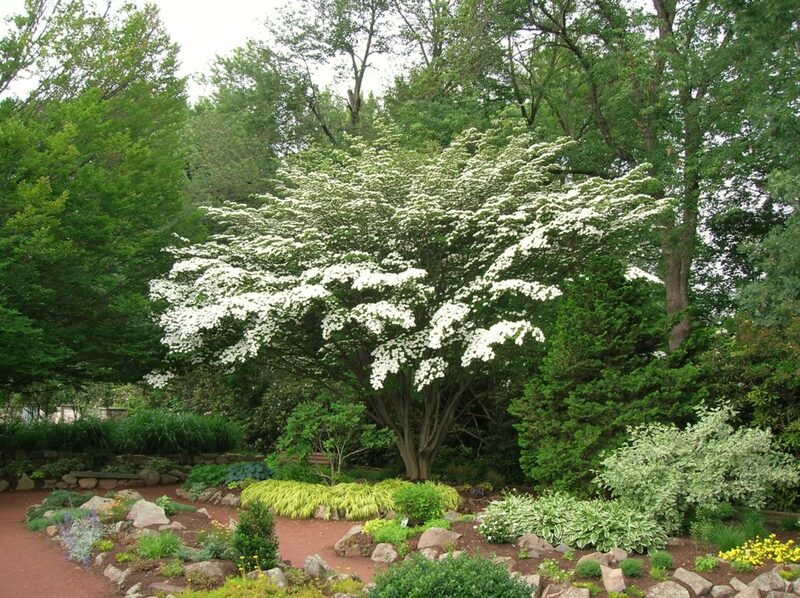 Among the best flowering trees for small gardens, especially noteworthy is the flowering dogwood (Cornus fiorida). A native American tree that is widely used, and one of the few with year-round appeal. In the spring, its large white or pink bracts, which look like petals, are strikingly familiar in gardens from Florida to Maine and west to the Mississippi River. As late summer approaches, the berries begin to turn a bright red. A variety with yellow fruits, though little known, is also handsome. Later in the fall, as the days grow colder, the foliage of the flowering dogwood becomes bright scarlet. After the leaves and fruits have fallen, the characteristic horizontal branching habit of this small tree is a prominent feature in the winter picture. Flowering dogwood grows in any good soil, and although it may suffer from trunk canker in some localities, it holds a distinctive position in this listing of small trees. Another small flowering tree native to the same section of the country as the dogwood and flowering at the same time is the native redbud or Judas tree (Cercis canadensis). A member of the pea family, its profuse, small, pea-like flowers, purple-pink, contrast with those of the white flowering dogwood. Also a small tree, not over 35 feet in height, it is usually under 20 feet in most gardens. Its fruits are merely flat pods, but the autumn color of the foliage is a bright yellow. Although redbud does not have special appeal during all seasons, like the flowering dogwood, it has merit when planted at the edge of woodlands or in combination with the flowering dogwood. An attractive tree, especially when in flower, is the golden-chain tree or laburnum, Two species are available and several hybrids which combine the best qualities of both. All golden-chains have pendulous clusters of yellow, pea-like flowers, somewhat similar to those of the wisteria, and when in full bloom make a brilliantly graceful display. However, they have no autumn color nor worthwhile fruits and give little shade because of their upright habit. They are, therefore, at their best when in full bloom in the spring. 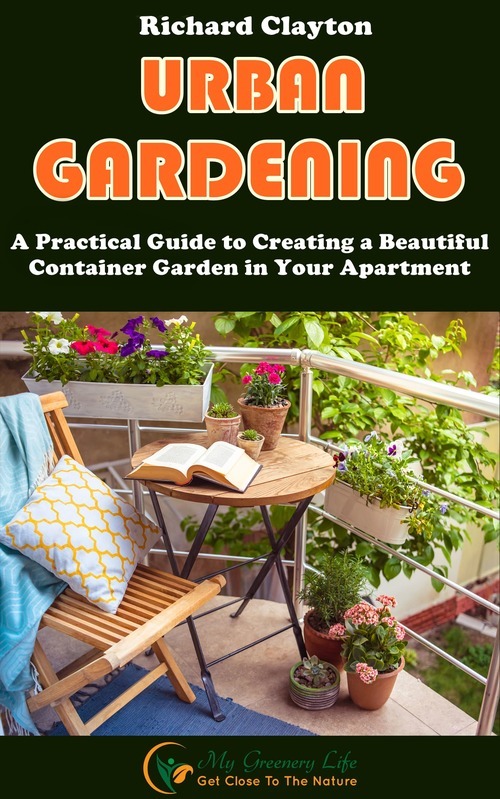 The plant does have some poisonous properties so educate yourself before planting. No group of small trees has so many flowering and fruiting candidates as the Oriental flowering crab-apples. Least susceptible to the blight of the juniper rust disease, common on our native crab-apples. Varieties of crab apples differ considerably in flower and fruit, as well as in growth habit. As a rule, flowers appear profusely in the spring and are followed by small fruits, a quarter to a half inch in diameter (some are nearly two inches across) that turn bright red or yellow, or red and yellow, in the fall. Some fruits remain on the tree late into the fall or winter, affording excellent food for birds when deep snow covers other food sources. Crab-apples do not need repeated spraying every spring (as commercially grown apples do). Usually, a once a year spraying, and sometimes one every other year, is sufficient to keep most leaf-eating insects under control. The striking carmine crabapple is one of the most popular red flowering kinds. The Japanese flowering crabapple (Malus floribunda) is still widely grown, although it was one of the first introduced to this country from the Orient nearly 150 years ago. It has red flower buds and sweetly fragrant flowers that gradually fade to white, creating a marked red and white color combination. The yellow and red fruits of the Japanese flowering crabapple are about the size of a large pea. Hybrids include doubles, with pink flowers and bright yellow fruits, a half inch in diameter. Each of these crabs has a mound-like habit and seldom exceeds 20 feet in height. 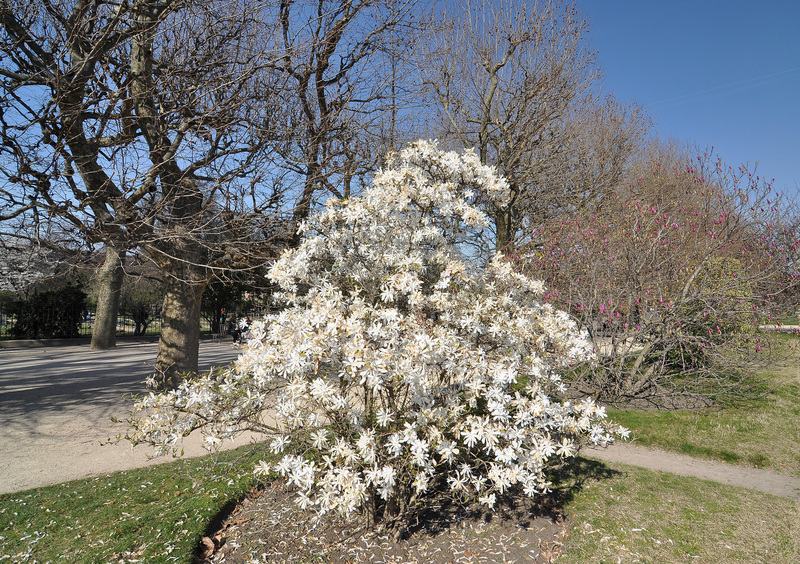 Another popular small ornamental tree is the star magnolia (Magnolia stellata), one of hardiest of all magnolias and an excellent candidate for the small garden, because even 50-year old specimens are not much over 18 feet tall. Slow growing, the star-like, 15-petalled, conspicuous, fragrant, white flowers appear very early in the spring before the leaves. A dense grower, it has clean foliage all summer long, which turns bronze in the fall. 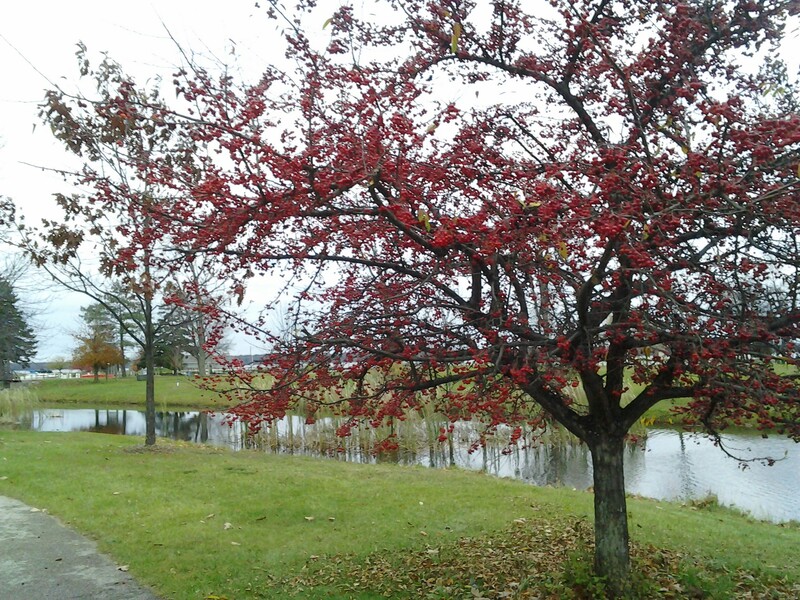 Another small tree of interest a Missouri native is the Washington hawthorn (Crataegus phaenopyrum). Its dense growth and screening potentialities and its ability to grow in many kinds of soil, rich and poor, are points in its favor. However, it does best in a moist-well drained soil. In early summer it produces profuse clusters of small white flowers, scarlet autumn color and its bright scarlet fruits which often remain on plants all winter are other assets. Owners of small properties, likewise, value this native tree, as one of the best, among some 500 native and exotic hawthorns. A truly superb small tree for the garden is the Japanese snowbell (Styrax japonica). Under 30 feet in height, it is wide spreading, with a flat top, often twice as broad as high. Small, white, waxy flowers, pendulous and bell-like, hang in profusion on the undersides of the branches. The foliage does not color in the fall but remains green very late in the season. The taller growing, gracefully pyramidal southern sourwood (Oxydendrum arboreum) is usually a small tree in gardens where the soil is acid. Its dark green, lustrous, laurel-like leaves become brilliant scarlet in the fall. Drooping clusters of small, white flowers appear in mid-summer when few trees or shrubs bloom. The native blackhaw (Viburnum prunifolium), growing to 15 feet, merits consideration. Glossy green leaves turn brilliant red in the fall. In spring, flat clusters of small white flowers emerge and followed by blue-black berries in the fall. This viburnum is often used as a substitute for hawthorns since it is not susceptible to as many insect pests and diseases.